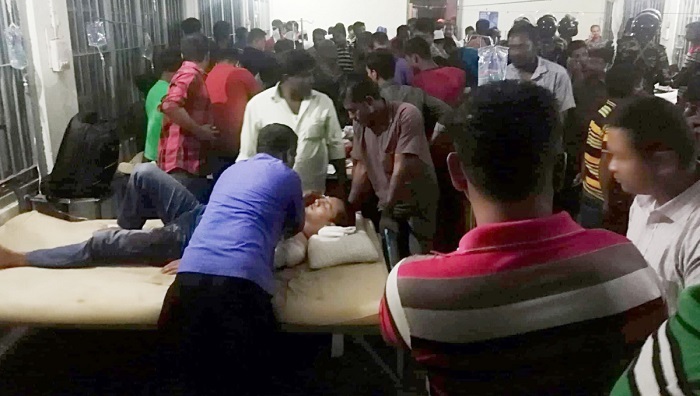 Seven people, including an assistant presiding officer, were killed and a presiding officer among 13 was injured in a gun attack on a vehicle of a motorcade carrying election officials and law enforcers in Baghaichhari upazila on Monday evening. The deceased were identified as M Amir Ali, 37, assistant presiding officer of a polling centre at Kanglak under Sajek and a teacher of Kachalong Girls’ School, Ansar VDP members Jahanara Begum, 40, wife of Tafsil Ahmed of Kachalong Bazar, Mihir Kanti Dutta, 40, son of Sadhu Basak of Karoshtali, Bilkis Akther, 50, daughter of Nur Ali of Paillagona, M Al Amin, 25, son of Selim of Sarikkha in the upazila, Toyeb Ali and bus helper Mantu Chakma, 25, said intelligence sources. However, the professional identity of Toyeb could not be confirmed, reports UNB. Superintendent of Police M Alamgir Kabir said the election officials and law enforcers were returning to the upazila headquarters in four vehicles after counting votes at the polling centre in the 2nd phase upazila parishad election. Terrorists opened fire on the last vehicle of the convoy from a hill at Noymile of the upazila around 6:30pm. The attack left the six dead on the spot and the others injured. On information, members of Bangladesh Army and Border Guard Bangladesh rushed in, rescued the victims with the help of locals and took them to the upazila health complex. The injured include presiding officer of the centre Abdul Hannan, five policemen and three Ansar VDP men. Of them, six were airlifted to the Combined Military Hospital in Chattogram where one of them was declared brought dead. Amid a tense situation, security was beefed up there. Intelligence sources said members of United People’s Democratic Front (UPDF, Proshid Khisa) might have carried out the attack. They said Barorishi Chakma, nominated by JSS (Santu Larma), contested the upazila parishad election from Baghaichhari against Sudarshan Chakma of JSS (reformists). Barorishi, however, boycotted the election halfway through, they said, adding that after the announcement of the polls boycott, various posts were made on Facebook threatening to launch an attack. Meanwhile, the Election Commission condemned the attack on the election officials, saying it will stand by the families of the deceased and the injured. The commission also directed for ensuring proper treatment of the injured, said a press release.